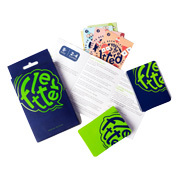 Win 1 of 10 Fletter Games! We're here to connect online consumers with the hottest toys on the planet and the best places to buy them. Use our natty toy finder to hunt out this season's coolest products - and sign up to our newsletter to get advance notice of our popular toy giveaways. "The Enhanced Supplier feature of Toy Shop UK is brilliant. It was easy to set up and the page looks great. It allows our customers to find out more about VTech, including our products and awards, whilst having direct access to our website and social media pages. It really is a one-stop-shop for information!" Since listing with Toy Shop UK we have noticed a steady increase in traffic to our site providing a great source of new customers. As a growing independent toy business it is refreshing and reassuring to get a listing site so dedicated to our industry packed with information to engage our potential customers. Online shop for purchasing unique soft and plush toys. A family-run business located in Greenwich. High quality toys for babies through to tweens.